In a recent op-ed in one of the Hebrew dailies, entitled "Why I called on Europe to recognize Palestine," revered novelist A.B. Yehoshua offered explanations for his joining some 1,000 other Israelis in supporting European parliamentary resolutions recognizing a Palestinian state with borders that follow the pre-1967 armistice lines. Yehoshua declared,"The first reason stems from the desire to signal to the moderate Palestinian camp not to give up on the peace process... The second reason stems from the growing fear... that the road to the two-state solution is being blocked because of Israel's unceasing settlements in the territories." But neither rationale holds up under even minimal scrutiny. No doubt there are moderate Palestinians that would be happy to live in peace in alongside Israel, but polls of Palestinian opinion demonstrate that they are a dwindling minority. In part this is due to the actions of Yehoshua and his associates in what he characterizes as "the peace camp," who two decades ago pushed Israel to embrace Yasser Arafat and his PLO as its peace partner. After two decades of indoctrination by media, mosques and schools controlled by Arafat and his heirs, indoctrination declaring that the Jews are merely colonial usurpers, that the Zionist state is illegitimate, and that it is the duty of Palestinians to dedicate themselves to its demise, moderates are a much rarer phenomenon. In addition, those that exist are cowed by the Arafat/Abbas thugocracy, whose methods are revealed by brave Palestinians to anyone willing to listen. And many moderates who had means to do so have emigrated, not wanting to live in a police state and not wanting their children to be educated in a system teaching them that the highest goal in life is to martyr themselves in efforts to kill Jews and help destroy Israel. What moderates remain, those for whom Yehoshua expresses concern, know that Abbas has no intention of changing the PA’s autocratic governance or of coming to an agreement with Israel no matter what concessions he is offered. Rather than being encouraged by European support for Abbas and for "Palestine," they see such support as more firmly setting the PA’s boot on their necks and making any prospect of peace more distant. One Palestinian moderate, Bassam Tawil, recently wrote of this in an article entitled "The Palestinians’ Real Enemy: Europe." No doubt genuine Palestinian moderates likewise view as hostile to their interests Israelis such as Yehoshua and his "peace camp" associates who happily endorse Abbas’s current European gambit. If Yehoshua truly wanted to understand why Palestinian moderates lose hope, he need only reflect on the impact of his own actions. And if he truly wished to encourage Palestinian moderates, he would be urging his European friends to condition their lavish financing of the Palestinian Authority on a loosening of the PA's stranglehold on dissent, an end to anti-Israel and anti-Jewish incitement and creation of a space for moderate voices in the Palestinian political arena. As to Yehoshua's second rationale for supporting European recognition of "Palestine," the settlements, Yehoshua sounds like an Israeli version of Rip Van Winkle, someone who has been asleep for the last two decades. If at the time of the Oslo Accords’ initiation, in 1993, about half of Israel embraced the delusion, despite all the evidence to the contrary, that sufficient territorial compromise would win Israel peace, that number has dwindled dramatically in the face of subsequent events. These include the rejection by the PA - under both Arafat and Abbas - of every Israeli offer of territorial compromise, including dismantling of settlements, as in 2000, 2001 and 2008, without Palestinian presentation of counter-offers. Also shifting Israeli opinion was Arafat’s launching of his terror war in 2000, which over the course of the next few years took more than a thousand Israeli lives and maimed thousands more; and the fallout from the 2005 unilateral withdrawal from Gaza, with the dismantling of all settlements there. Israelis have not been impervious to the subsequent rocket bombardments and other terrorist forays from Gaza, or to their forcing the nation into three wars in less than a decade. All of this may be lost on Yehoshua; it has not been lost on the majority of Israelis, including a majority of those that once supported Oslo. However much Israelis chose to delude themselves in the past, most now recognize what Abba Eban recognized almost 50 years ago, that Israel could not survive within the 1967 armistice lines. Most Israelis don't want either the PA or Hamas digging tunnels from one Jerusalem neighborhood to another or firing mortars from one to another or at Ben Gurion airport. Nor do they want an Arafat-type terror war launched from across those armistice lines. UN Security Council Resolution 242, unanimously passed in the fall of 1967, calls for new, "secure and recognized boundaries," and its authors spoke of how the pre-1967 lines were indefensible and only invited aggression against Israel. Settlements have been built overwhelmingly in strategic areas Israel would need to retain to defend itself, and most Israelis recognize that necessity. Why does Yehoshua then cling to settlements as a key issue, or to the absurdity that it is Israelis who are somehow frustrating Palestinian moderates? Why, more generally, does Yehoshua cling to the delusion that Israel has a genuine peace partner in the PA and sufficient Israeli concessions would see peace attained? Writing three decades ago, Yehoshua spoke of Israel’s right to defensible borders, to be in a position to defend itself. He also spoke of the self-doubt engendered by the chronic Arab siege and of the danger of internalizing the indictments of the nation’s enemies. He stated at one point: "Self-hatred, an attempt to identify with the enemy, to elude him by adopting his positions... What emerges, then, is total criticism of everything done in Israel: everything appears to be faulty and futile." Given these views, what could have led Yehoshua to his own shrill, deluded indictments of Israel and vocal championing of the positions of the "peace camp"? But the notion that Israel, by its own actions, most notably territorial concessions, can bring about peace, is, again, a delusion of which most Israelis who once embraced the Oslo debacle have since been disabused. The Arabs are by far the dominant force in the region around Israel, and peace will come on the Arabs’ timetable, not Israel’s. And it should be obvious to all observers that neither the Palestinian leadership nor virtually all the rest of the Arab world is prepared to recognize Israel’s legitimacy, end the pursuit of her destruction, and enter into a genuine peace with her at this time. Israel can at best deter aggression against her, and defeat aggression when deterrence fails. But it cannot force peace upon its neighbors, neither by force of arms nor by concessions. Yehoshua refuses to recognize and reconcile himself to this reality. And so he joins with Europeans, who are largely either hostile to Israel’s well-being or at best indifferent to it, in endorsing a Palestinian agenda for establishing a state without any bilateral agreement with Israel and without foregoing future claims against the Jewish state. As parliaments in more and more European nations vote to recognize "Palestine," European politicians insist they are doing so to promote the objective of an independent Palestinian state living in peace beside a secure Israel. But both the declared aims of Palestinian leaders and the pattern of European policy vis-a-vis Israel and the Palestinians give the lie to European averments of benign intent. Neither party of the divided Palestinian leadership has, to say the least, demonstrated an interest in peace with Israel. Hamas, now controlling Gaza and enjoying extensive popularity in the West Bank, openly trumpets its objective not only to destroy Israel but to annihilate all the world's Jews. The Palestinian Authority under Mahmoud Abbas repeatedly insists it will never recognize Israel's legitimacy as the national homeland of the Jewish people and will never give up its demand for implementation of the so-called "right of return" of millions of descendants of Palestinian refugees to Israel - thereby demographically destroying the Jewish state. In the same vein, it conveys it will never sign an end of conflict agreement with Israel no matter what territorial concessions the latter offers. Palestinian Authority media, mosques and schools, like those of Hamas, incessantly indoctrinate their audiences in the message that the Jews are colonial usurpers and their presence, and their state, must be expunged, that Palestinians who attack and kill Israeli civilians are heroes, and that it is the responsibility of all to emulate those heroes in the struggle for Israel's annihilation. Abbas, like Arafat before him, has made clear his goal in seeking recognition of "Palestine" by European nations and by others is to force the establishment of a Palestinian state without any bilateral agreement with Israel that would require Palestinian foreswearing of additional claims against the Jewish state. 1) Palestinian insistence on the "right of return" obviously precludes an agreement that allows for Israel’s continued existence. Any genuine peace would require whatever resettlement there is of Palestinian refugees and their descendants to take place within the territories allotted to the Palestinians. If the Europeans were truly interested in a two state solution, they would insist that some of the largesse they now lavish on the Palestinians be dedicated to creating decent, permanent housing for those Palestinians residing in "refugee camps" within areas already under Palestinian control. But they have not done so. 2) The United Nations Relief and Works Agency (UNRWA) has provided for Palestinian refugees and their descendants for sixty-five years. Every other refugee population in the post-World War II era has been cared for by another UN organ, the United Nations High Commissioner for Refugees (UNHCR). In addition, with all other refugee populations, whose total numbers over the decades have been orders of magnitude greater than the Palestinian number, "refugee" is defined as an individual actually displaced by hostilities or related events, not his or her descendants as well. The special status accorded the Palestinians has obviously been orchestrated by the Arab states and their allies to use as a permanent weapon in the fight for Israel's annihilation. Were Palestinian refugees defined in the manner of all other refugees, they would now number at most less than 50,000 and Israel might even entertain offering those individuals the option of return in the context of a peace settlement. But the Europeans continue to support and generously fund the unique UN treatment of Palestinian "refugees" and continue to help Palestinian leaders wield this cudgel against Israel's continued survival. Moreover, UNHRW schools, often employing Hamas-affiliated and PA-affiliated teachers, contribute to the indoctrination of Palestinian children in the cause of pursuing Israel's annihilation, and UNHRW facilities have served as recruiting, training and logistical centers for Hamas and other Palestinian terror organizations. Yet this, too, has elicited virtually no objection, or curtailment of support, from European nations. 3) As noted, PA media, mosques and schools are focused on indoctrinating their audiences in anti-Israel and anti-Jewish hatred and on the necessity of pursuing Israel's destruction. Yet many of the relevant PA institutions enjoy European financial support. 4) The PA provides extensive financial support to the families of Palestinian terrorists- both of those killed and of those imprisoned by Israel - and the European states have done little to prevent the use of European funds for this purpose. 5) Genuinely moderate Palestinian voices, those who would support a viable two-state solution, are an endangered lot. After twenty years of indoctrination by PA and Hamas media, mosques and schools, the great majority of Palestinians, according to opinion polls, support anti-Israel violence and the objective of Israel, and its Jews’, annihilation. What moderates remain in the territories are either cowed into silence by the PA and Hamas, or are subject to harassment, assault and arbitrary arrest. This has been the fate, for example, of Palestinian journalists who have dared to report on PA corruption or to question PA policies that preclude a peaceful settlement with Israel. European nations have done virtually nothing to come to the aid of Palestinian moderates, to support the different, often genuinely peace-promoting, course they seek to advance, or even to pressure the PA to end its abuse of them. 7) Areas Israel has not already ceded to the Palestinians - either via agreement, as in Areas A and B now governed by the PA, or unilaterally, as in Israel’s withdrawal from Gaza - have the status in international law of disputed territory. UN Security Council Resolution 242, unanimously passed in the fall of 1967, calls for the negotiation of new "secure and recognized boundaries," and the authors of 242 argued that the pre-1967 lines were merely armistice lines, were indefensible, and left Israel vulnerable to future aggression. Yet many European states insist on referring to those lands as Palestinian, precluding the negotiated agreement on boundaries envisioned in Resolution 242 and seeking to deprive Israel of defensible borders. In a similar vein, European states routinely attack any Israeli construction in the disputed territories. One can argue that creating such facts on the ground does prejudice ultimate agreement on the land’s disposition. But the same European states are not only silent on no less prejudicial Palestinian building in the disputed areas but actually support and fund it. Since Palestinian construction has largely been focused on reinforcing claims to areas that would leave Israel more strategically vulnerable, European states are in this manner as well working against the Jewish state’s achieving an agreement that would provide it with defensible borders. 8) The recognition of "Palestine" by European parliaments obviously violates prior endorsement by European states and the European Union of agreements calling for resolution of the Israeli-Palestinian conflict via bilateral negotiations. At the same time, in a further demonstration of shameless European anti-Israel hypocrisy, Europe threatens measures against Israel if it does not re-engage in bilateral negotiations with the Palestinians. In fact, it is Israel that has most sought to advance such negotiations and the Palestinians that have shunned them. It is Israel that has - in, for example, 2000, 2001, and 2008 - made repeated concrete offers of a territorial settlement and the Palestinians that have rejected all of them without providing any counter-offers. Rather, they have sought to pursue an agenda of advancing their cause - the cause of replacing Israel - by means other than bilateral negotiations, as in their seeking recognition of "Palestine" by European states and international bodies. And the Europeans at once help them move forward on their alternative path while excoriating Israel for ostensibly rejecting direct negotiations. For all the self-righteous doubletalk from Europe about seeking to promote a peace that will serve both the Palestinians and the Jewish state, what the Europeans are promoting by their actions is the exterminationist agenda of the Palestinian leadership and reeks of age-old, murderous European anti-Jewish bias. Repeated claims in recent weeks by Palestinian Authority president Mahmoud Abbas that Israel was attacking or otherwise threatening the Al Aqsa mosque on the Temple Mount, and Abbas’s calls for Palestinians and other Muslims to take action to defend Al Aqsa and "purify" the Temple Mount, have been a key factor in the latest spate of deadly Arab assaults on Israelis. Other PA officials have echoed and elaborated on Abbas’s message, with some calling explicitly for murdering Jews in response to supposed provocations against Al Aqsa. Palestinian Authority media have conveyed the same message, punctuated by cartoons depicting Jews attacking Al Aqsa and Palestinians defending it. A number of those involved in the assaults against Jews in Jerusalem and elsewhere have asserted that they were acting in response to the calls of their leaders to protect Al-Aqsa. The false claims of Jewish threats against or damage to Al Aqsa have a long pedigree. They have been made by Abbas many times in the past and were a staple of Yasser Arafat’s screeds against Israel and against Jews more generally. Arafat labeled the terror war he launched in 2000 the "Al Aqsa Intifada." He did so to cast the onslaught not as an aggressive campaign of mass murder of Israelis but as a struggle in defense of the Islamic holy site and to render the war not simply one of Palestinian pursuit of Israel’s destruction but as an Islamic fight against hostile, Al Aqsa-defiling non-believers. But such anti-Jewish libels have a still older history, pre-dating Arafat, pre-dating Israel’s gaining control over the Old City of Jerusalem in 1967, even pre-dating Israel’s creation. In 1929, during the British Mandate, the rabidly anti-Jewish, British appointed Grand Mufti of Jerusalem, Haj Amin el-Husseini, claimed that Jews were threatening Al-Aqsa and sought to end Jewish prayer at the Western Wall (a Temple Mount retaining wall, which had become a place of Jewish prayer in the context of Jews being barred from ascending to the Temple Mount itself - the site of the First and Second Temples - for much of the preceding 2,000 years). According to the Mufti, the Western Wall was an Islamic holy place and Jewish prayer there was both an affront to Islam and a step towards Jewish attacks against Al-Aqsa. The Mufti is also reported to have distributed doctored photographs showing a damaged Al-Aqsa, with claims that the Jews were responsible. The Mufti’s incitement was accompanied by calls for the murder of Jews as revenge. Ensuing attacks by Arab mobs in Jerusalem and elsewhere in Mandate territory resulted in the death of 133 Jews and major injury to over 200 others. The most severely affected community was that of Hebron, where 64 Jews were slaughtered and another 85 injured. British authorities did virtually nothing to stop the attacks. They did evacuate the surviving Jews from Hebron. They also exonerated the Mufti from any responsibility for the murders and took almost no steps against those who actually carried out the carnage. Abbas has praised the Mufti as an inspiring hero of the Palestinian cause worthy of emulation. In reality, far from threatening Al Aqsa, Israel has repeatedly bowed to Arab claims of exclusive rights on the Temple Mount. In the wake of Israel’s gaining control of the Old City and the Temple Mount in 1967, the Israelis, with then defense minister Moshe Dayan delineating the policy, granted the Muslim religious authority, the Waqf, control over the Temple Mount. Jews would be allowed access to the Mount but forbidden to pray there. Christians and other non-Muslims would also be allowed access. The Israel Antiquities Authority was to oversee any construction or other physical changes on the Mount that would have an impact on this most sensitive of archaeological sites. The prohibition of Jewish prayer on the Mount has been strictly enforced by Israeli governments. While there is increasing support among Israelis for a small area of the Mount - far from Al Aqsa and the Dome of the Rock - to be set aside for Jewish prayer, no such arrangement has won government backing. Furthermore, Jewish and other non-Muslim visitors to the Temple Mount have commonly been harassed by Waqf guards and other Muslims, and Israeli officials have responded typically not by countering such harassment but by restricting non-Muslim access. Also, particularly between 1999 and 2001, the Waqf, in the context of establishing and expanding additional places of Muslim worship on the Mount and seeking to destroy evidence of historic Jewish (and Christian) connection to the Mount, brought heavy earth-moving equipment onto the Mount and dug up and hauled away thousands of tons of material. This material contained the remains of structures and other relics from pre-Muslim epochs, most notably from the First and Second Temple periods. In the context of any archaeological excavation of such a sensitive and historically rich site, the work would have been approached with archaeologists’ hand trowels and brushes. Yet the Israeli government - led for most of this period by Ehud Barak - did nothing to block this desecration of the Temple Mount, and the Israel Antiquities Authority likewise did nothing. A broad coalition of Israelis, drawn from across the nation’s political and religious spectra and including such luminaries as Amos Oz and A.B. Yehoshua, formed "The Council for the Prevention of Destruction of Antiquities on the Temple Mount" and urged the Barak government to stop the desecration, but to little avail. So the Al Aqsa libel stands truth on its head: Muslim supremacism on the Temple Mount has not only been maintained since Israel gained control of the Old City, but has been expanded through aggressive Muslim actions and general Israeli acquiescence. Bur the anti-Jewish libel lives on, because it, and the violence it generates, serve its purveyors. Abbas uses it to build up his own anti-Israel and anti-Jewish bonafides against the popularity of Hamas among Palestinians. He also employs it to draw wider Arab attention away from the bloody chaos enveloping much of the Arab world, chaos that has led some Arab leaders to at least temporarily relate to Israel as an ally confronting shared threats. Abbas seeks to resurrect the focusing of Arab enmity on Israel. Abbas is also using the Al Aqsa libel and the accompanying bloodletting to advance his pursuit of UN and European "recognition" and international pressure on Israel for unilateral concessions, particularly withdrawal to the indefensible pre-1967 armistice lines. Abbas, like Arafat before him, seeks to achieve Israeli withdrawal while avoiding any bilateral agreement with Israel that would entail formal acceptance of Israel’s legitimacy within any borders. The Grand Mufti’s Al Aqsa libel and his incitement to the murder of Jews ultimately served him well. An investigating commission sent from London found the Arabs fully responsible for the bloodshed but then recommended steps be taken against the Jews so as to assuage Arab hostility, steps that violated Britain’s obligations to the Jewish community under the terms of its League of Nations mandate. European and some American media coverage of the recent violence, and the reactions of United Nations officials, various European governments and, with rare exception, the Obama administration, downplay or ignore entirely Abbas’s cynical use of the libel and incitement of murderous violence. Some distort the realities surrounding the violence into an indictment of Israel. And so again the libel and its murderous fallout redound to the perpetrator’s gain. The recent vote in Britain’s Parliament to recognize a Palestinian state (passed by 274 to 12) is, we are told, of no real consequence. Prime Minister Cameron’s government has said it signals no change in British policy. But the vote was promoted by anti-Israel voices in parliament that support the boycott, divestment and sanctions movement against Israel, have called for a total European trade embargo against the Jewish state, and have compared Israel to Nazi Germany. It was also promoted by some Israelis, as is inevitably the case with anti-Israel actions emanating from any quarter. Most notably, as reported in the Times of Israel, "some 300 ex-diplomats, former ministers and activists" signed a letter supporting the parliamentary motion. While the motion refers to a Palestinian state "alongside the state of Israel," it, in fact, advances what was Yasser Arafat’s goal both before and during the Oslo years and has been Mahmoud Abbas’s aspiration since he succeeded Arafat: to win recognition of a Palestinian state in all the territory beyond the pre-1967 cease-fire lines and to do so without any end-of-conflict agreement with Israel. On the very evening of the famous signing of the first Oslo accords on the White House lawn in September, 1993, Arafat, appearing on Jordanian television, declared to his Palestinian constituency and to the wider Arab world that they should understand Oslo as the first phase of the Plan of Phases. The reference was to a policy elaborated by the PLO in 1974 and calling for acquisition of whatever territory could be gained by negotiations and subsequent use of that territory as a base for pursuing Israel’s destruction. He repeated this explanation of Oslo at least a dozen times within a month of the White House ceremony and many times thereafter. At the Camp David negotiations in the summer of 2000, Arafat rejected all the concessions offered by Prime Minister Barak and President Clinton and offered no counter-proposals, as the concessions came with the expectation of Arafat signing an end-of-conflict agreement and he had no intention of doing so. Instead, in September, 2000, he launched his terror war against Israel which, in the ensuing several years, left thousands maimed and murdered. He also sought to win European recognition of "Palestine," with borders following the pre-1967 armistice lines and without any Palestinian-Israeli agreement or any commitment by the Palestinians to forego future territorial claims. The Europeans rejected Arafat’s blandishments, in no small part because of forceful Clinton Administration opposition to such recognition. But Mahmoud Abbas has continued to pursue Arafat’s game plan. He, too, has rejected as inadequate extensive Israeli concessions, such as those offered by then prime minister Ehud Olmert in 2008, has offered no counter-proposals, and has sought to gain world recognition of "Palestine" along the pre-1967 armistice lines without any agreement with Israel or any renunciation of further claims. In addition, like Arafat, Abbas uses Palestinian media, mosques and schools to indoctrinate his people to dedicate themselves to Israel’s destruction. The incessant message is that Jews have no historic connection with the land of Israel, that they are merely colonial interlopers whose state must be expunged, that terrorists who have successfully targeted Israeli civilians are heroes to be venerated, and that it is the obligation of Palestinians to pursue Israel’s annihilation. Abbas has now, of course, formed a unity government with Hamas, which even more explicitly declares its commitment to Israel’s extirpation and indeed calls for the murder of all Jews. But Abbas has made more progress than did Arafat in winning the recognition he desires outside of any agreement with Israel. He is now aggressively pursuing more substantive successes in that course both at the UN and in Europe. Why would some Israelis, including "ex-diplomats, former ministers and activists," support Abbas’s gambit? The explanation lies in why about 50% of Israelis in 1993 embraced Yasser Arafat as a "peace partner" even as Arafat continued to make clear his objective remained Israel’s destruction. All Israelis want an end to the Arab-Israeli conflict, and many were so desperate for some resolution that they deluded themselves, despite all the evidence to the contrary, that sufficient Israeli concessions, particularly territorial concessions, would indeed win peace. In fact, Arafat’s arrival in the territories, in July, 1994, was accompanied by an unprecedented increase in anti-Israel terror. 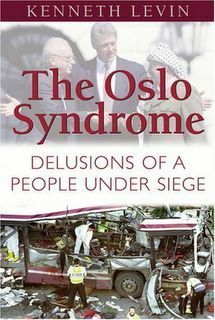 Despite his commitments in the first Oslo agreements to clamp down on those involved in attacks on Israelis and to end incitement, Arafat did little to curb the terror, publicly praised those involved in it, and, as noted, used the media, mosques and schools now under his control to promote the objective of Israel’s destruction and encourage anti-Israel violence. Even a few within the Israeli elites - academics, journalists, writers and artists - who were Oslo’s most prominent promoters had second thoughts. For example, senior Haaretz columnist Ari Shavit wrote several years after the initial implementation of Oslo, "In the early ‘90s.... we, the enlightened Israelis, were infected with a messianic craze... All of a sudden, we believed that... the end of the old Middle East was near. The end of history, the end of wars, the end of the conflict... We fooled ourselves with illusions. We were bedazzled into committing a collective act of messianic drunkenness..."
But those prominent Israelis supporting the recent vote in Britain’s parliament represent the many within Israel’s elites who - then, and in all the years since then - continued to cling to their "messianic drunkenness." Consider one among them, Yossi Sarid, a minister in the Oslo government. Despite all that Arafat was saying and doing to incite his people against Israel and promote terror, Sarid insisted it was others who were the source of all the problems. He argued that Arafat was not acting in accord with his Oslo commitments because he had not yet been given enough by Israel to demonstrate to his people the benefits of Oslo and so did not have the public support to crack down on the terror or eschew incitement. Therefore, the proper Israeli response to the increased terror and to Arafat’s hate-mongering was to give him more concessions more quickly! Within the general Israeli public, a much greater shift in opinion followed Arafat’s launching of his terror war after walking out of Camp David in July, 2000, and the subsequent tremendous increase in those murdered and maimed by Palestinian terror. If close to fifty percent of Israelis had earlier supported Oslo, that percentage now fell substantially. But the academic, media and cultural elites continued over-represented among the persistent true believers. The rapid shift in public sentiment was reflected in Ariel Sharon’s landslide election victory in February, 2001, and in subsequent widespread unhappiness with Sharon’s holding back for many months from taking strong military steps to stop the terror. Even Chemi Shalev, very much a voice of the pro-Oslo Israeli Left, spoke in July, 2001, of Sharon’s "policy of restraint" and noted that it was "extremely unpopular in the Israeli public. It was only after the monthly death toll of terror victims reached 133 in March, 2002, that Sharon ratcheted up the military response and approved sustained raids into Palestinian terrorist bastions. But Yossi Sarid, in an op-ed in the New York Times in December, 2001, largely blamed Sharon for the violence and the absence of peace. His main criticism of Arafat was not that he had launched and was relentlessly pursuing his terror war against Israel or that he remained dedicated to the goal of Israel’s destruction but that Arafat "has foolishly played into Mr. Sharon’s hands." Sarid, and his like-minded fellow travelers, whenever faced with a choice between protecting Israelis or protecting and defending their own delusions, their wishful thinking that sufficient Israeli concessions would lead to a genuine peace, have almost invariably chosen, and promoted, the latter. And so now they work to advance the Arafat-Abbas agenda for the phased destruction of the Jewish state, and cheer on and encourage European parliamentarians to actions pushing that agenda forward, parliamentarians who are often openly hostile to or at best indifferent to Israel's continued existence and well-being. Sarid and his associates’ doing so is just the latest display of their ongoing intoxication with the "messianic drunkenness" of the Oslo era.